Yoga for Cancer Care offers Yoga practices to nourish the minds, bodies and spirits of people whose lives have been affected by cancer, empowering them to be active participants in their own well-being. Y4CC is a partnership between Yoga Loka and PS108, a non-profit yoga studio, offering private sessions, classes, workshops and retreats, both on-site and in outreach settings. Group classes are held by donation at several New Jersey locations in both Hunterdon and Somerset Counties. YFCC classes are appropriate for any level of ability or experience, tailored to meet the needs of the individual and or class. Classes include, but are not limited to, yoga postures (asana), breathing exercises (pranayama), meditation and visualizations to encourage healing, strength and inner peace. YFCC retreats are held throughout the year under the direction of Kelly Harth. Our retreats provide the participant an opportunity for relaxation, for community support to learn and experience yoga and complementary therapies in a safe and supportive environment. Please note that both classes and retreats are open to support partners as well as patients. Please check the "workshop" link for the next event. Research supporting the benefits of yoga in cancer care is ongoing. Many cancer centers have incorporated yoga as part of their Complementary or Integrative Care services in recognition of the increased sense of well being in both the patient, families and support partners. It is in this same spirit that YFCC brings classes and retreats to this population. Please click here for a more complete explanation of these findings. 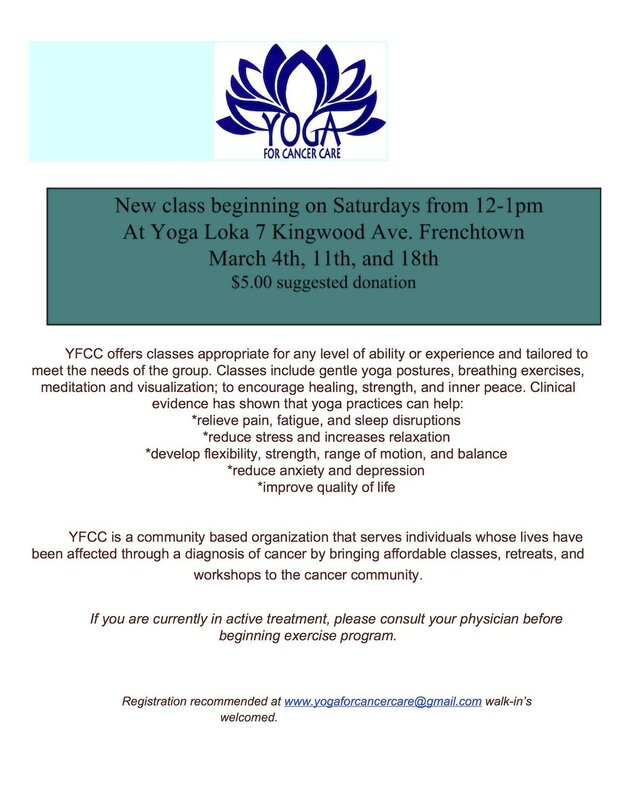 Please contact us by email through yogaforcancercare@gmail.com or by phone at 908-268-7430. Lastly, you may also visit www.ps108.com f or call 908-439-2949 for inquires regarding or scheduling a retreat or outreach program. Check the "Workshops" link for monthly RESTORE AND RENEW and weekly GENTLE classes that may also meet your needs.